Many of the top things to do in Pai, Thailand, are free. Even just cruising through the green countryside on two wheels between sights is enjoyable. The traffic endlessly circulating Chiang Mai’s moat suddenly seems pleasantly far away. Pai, a small-but-busy tourist town in Northern Thailand, has evolved into an interesting destination over the years. Although Pai’s “hippie” roots have since been plucked, the holistic health and natural food scene is still very much alive, as is the peaceful vibe. But Pai isn’t just all early morning yoga: nightlife and late-night socializing—if you choose to partake—are defiantly abundant. When visiting Chiang Mai, plan to spend a few days just four hours north in Pai. But be warned: many travelers plan a day or two in Pai and end up burning their visas there! All of the best things to do in Pai on this list are easily accessible via scooter—grab a map and go! Small sights and attractions can be combined for a fun day of adventure. The green scenery, rural roads, and fresh air make driving in Pai a real joy. Scooter rentals cost as little as $5 per day. Informal classes are available if you’ve never been on a scooter before. Lots of travelers learn to drive in Pai and a few learn to crash while there, too. Even though locals rarely do, you should wear a helmet. After arriving in Pai, expand your options by grabbing a Pai Events Planner. The free, long-running booklet is published regularly with a host of options for enjoying in Pai. Look for PEPs along the Walking Street and in various cafes and restaurants. The map and calendar of events will come in handy during your visit to Pai. You’ll see weekly listings for classes and workshops that include subjects such as cooking, fermenting kombucha, yoga, tai chi, meditation, martial arts, permaculture, mud-brick house building and other interesting disciplines. In 2008, seismic activity ripped a gash in a farmer’s field, just south of Pai. Walking through the geological spectacle will consume maybe just 20 minutes of your time, but the farmers’ hospitality and healthy treats from their farms will make you want to linger and chat for a while. Stop in for some locally grown dried fruit and snacks. Entrance is free, but a small donation is encouraged. If driving up from Chiang Mai on Highway 1095, you’ll actually pass the left turn for the land split. It’s worth a brief stop. Although Pai Canyon, also south of town on Highway 1095, isn’t as big or grand as the name suggests, it is one of the most popular things to do in Pai. Sunset is beautiful there when conditions are right, but that’s also the time when large groups turn up. Go earlier to enjoy the short hike and some tranquility before the tourist trucks arrive. The path narrows between sharp drop-offs, and some easy scrambling becomes required to continue. Those parts may not be suitable for small children, but everyone can hike the main path to the “rim” for a look. The canyon is dusty and exposed during the hot season. Be sure to wear a hat, and don’t expect much shade! The Boon Ko Ku So Bridge is a meandering bamboo bridge built over a rice paddy. Views during the wet growing season are green and mesmerizing. Don’t expect much more than peace, brown scrub, and few visitors during the dry-season months. Entrance is free, and the verdant scenery is well worth the 25-minute drive from town. A small cafe at the start of the bridge serves cold drinks to enjoy while watching content water buffaloes in tranquility. Find the bridge by looking for a sign on Highway 1095 south of town. When coming from Pai, the turn will be on the right. Even though March and April high temperatures in Pai can rival those in Chiang Mai, travelers still crowd into the hot springs to soak in sulfuric water and smear volcanic mud. Sai Ngam Hot Springs is a far less busy alternative, but it’s a 30-minute drive north of town. Look for signs advertising the Pai Hot Springs near the Memorial Bridge and Pai Canyon. The Hot Springs are open from 8 a.m. to 6 p.m. and entrance is 200 baht. There are several waterfalls within easy scooter distance of Pai. You can wade and cool down beneath the falls—particularly good options during the hot afternoons of April and May. Don’t expect a Niagara experience: the falls may be little more than a trickle until the regular showers of monsoon season return. When there’s enough water, local kids and travelers alike enjoy sliding on the smooth rocks into the natural pool at the Mo Paeng waterfall. Be warned: the water gets very shallow and isn’t deep enough for safe diving during the dry season. Pam Bok Waterfall, another nearby option, is located at the scenic end of a narrow canyon, adding to the adventure. Not in the river! Instead, go to the friendly Bueng Pai Farm where you can pay to fish in the lake that’s stocked with many large species. Equipment, bait, buckets, and instructions are available; catches are released, of course. As is often the case if fish aren’t biting, the experience is very much about the setting. Cold drinks are available, as are bungalows if you want to stay a little outside of town and fish in the cooler mornings. The overlook just beyond the “Chinese Village” tourist attraction is a grassy hill with a few benches and pleasing views of the valley. The meager entrance fee includes a small pot of tea (you may have to ask for it) to enjoy in your own serene corner atop the hill. Santichon Village, referred to locally as the “Chinese Village” isn’t much—it will only occupy 20 minutes of your time unless you decide to try a hand at archery, horseback riding, or one of the other tourist activities. The Chinese Village is just a 15-minute drive northwest of Pai. The overlook is on the same road just beyond the village. A great sunset alternative to Pai Canyon is the big white Buddha statue (Wat Phra That Mae Yen) visible from town. 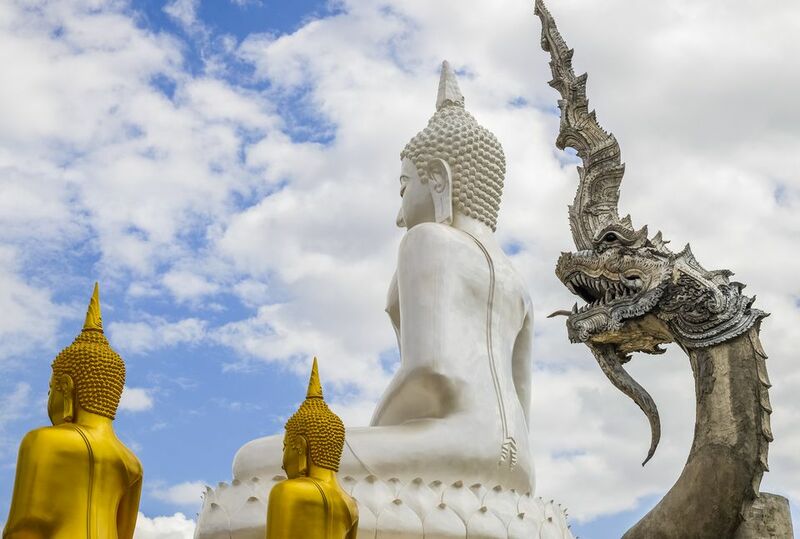 Views from the top are superb, and the serene statue posed in half-lotus position creates a tranquil environment for catching your breath after the climb. The many steps up to the statue make for a great cardio workout in the morning. Find the big Buddha statue just around the corner from Pai on a steep road that splits from Rural Road 4024. Save money and enjoy a local experience by walking to the afternoon market to buy your fresh fruit—that’s where many of the carts and restaurants along the Walking Street get theirs! As with many markets, travelers brave enough to wander deeper into the heart and haggle a bit are rewarded with better prices. Keep an eye out for mangosteens, the Queen of Fruit, between May and August. Find the afternoon market in Pai town just south of the walking street. Pai has a reputation as a hub for holistic health and natural living in Northern Thailand. Delicious vegan and vegetarian options abound—even reluctant herbivores will appreciate the fresh, locally grown produce. Juice shops and medicinal teas are easy to find. You’ll see numerous fliers advertising morning and sunset yoga sessions. The Earth Tone Cafe has natural medicines and hard-to-find ingredients for sale. Art in Chai, Om Garden Cafe and Chew Xin Jai (vegan) are a few of the many healthy, interesting options. Hey, it’s all about yin and yang, right? Pai is a bit of an anomaly. Many travelers turn up expecting a quiet, “hippie” town where organic juice is the only option on tap instead of Thailand's usual three beers. They soon discover that the nightlife in Pai can top that in Chiang Mai. It often goes until sunrise, too! For such a small place, the range of open-air options for socializing is superb. From live performances at the Mojo Cafe and Edible Jazz cafe to hard-hitting tunes and décor at the punk-rock Bla Bla Bar, Pai has a choice for all moods. The after-hours Don’t Cry Bar goes very late for anyone left standing. Yoga and reiki aren’t the only options in Pai. You’ll find advertisements for tai chi, qi gong, and other internal disciplines. Many are posted by teachers living in Pai who offer private classes at nearby health retreats. For self defense and serious sweating, there are two excellent Muay Thai camps and a Chinese kung fu retreat nearby. All cater to students of every level; accommodation bundles and training packages are available. Pai has plenty of deliberate, quirky, tongue-in-cheek kitsch that unapologetically declares: yes, this is a tourist destination, but we do it as cute as possible. The roadside kitsch attractions begin miles before reaching Pai. Located on the left side of Highway 1095 is a cafe dedicated to Halloween and witches. As you approach nearer to town, you’ll have to choose between sprawling-yet-inviting options such as Coffee in Love and Love Strawberry Pai. These places have treats, drinks, merchandise, and plenty of backdrops for taking fun selfies. Of all the interesting things to do in Pai, it's the combination of quirky draws that lends such a fun personality to the town.